Way back in February, we did a two week long study about Nutrition and Healthy Habits/Dental Health. Here are a few pictures of the new things we did this year. 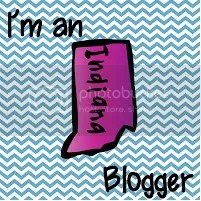 (You can search my blog for other ideas from last year). This is a food pyramid that we created. 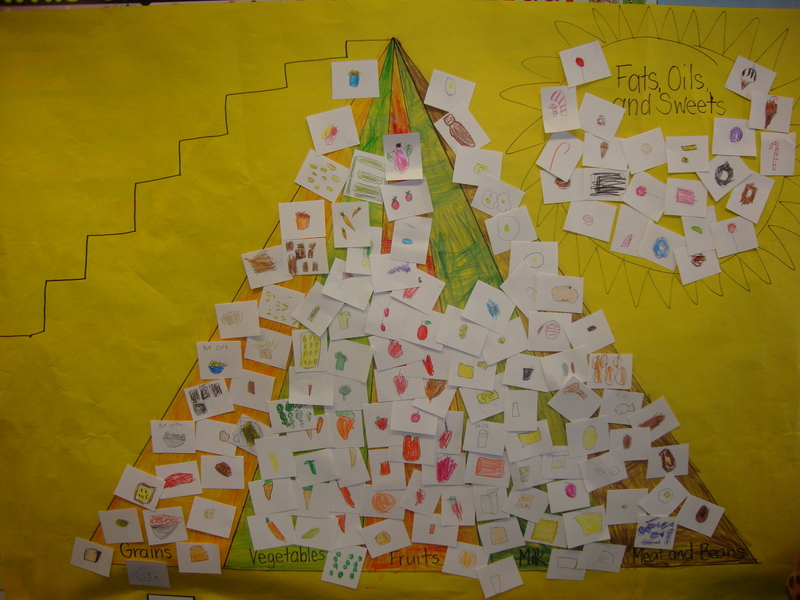 I free handed a pyramid and then one food group at a time, the children drew pictures on precut index cards (2 1/2 x 2 1/2). As they finished, they would bring them to me to tape on the pyramid. Each table got to color one section as well. I have these books that are specific to each food group, so we would read those first and get some ideas about what to draw. This was a chart I got several years ago with some other Nutrition information. 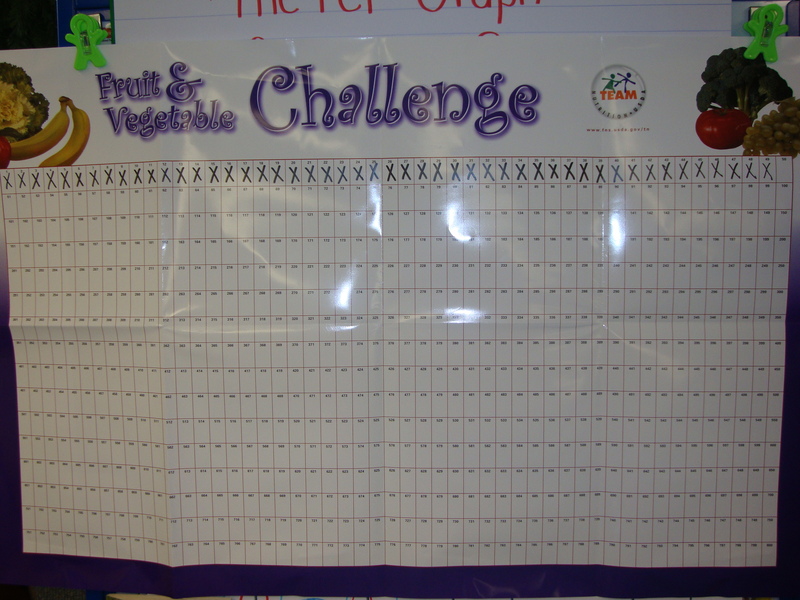 It is dry erase and we were trying to check off how many fruits and vegetables we ate each day at lunch. 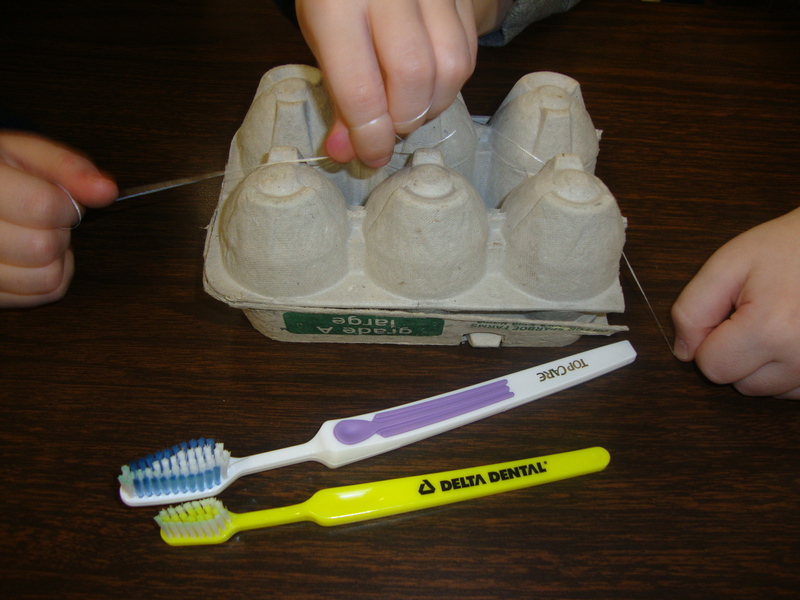 We practiced brushing our teeth using egg cartons. I cut the dozen sized cartons in half and we first flossed and then brushed the “plaque” off. We also used pictures of teeth in sheet protectors and I drew “plaque” on them with a dry erase marker and the kids had to erase it, so if these toothbrushes look a little green, that’s why! Posted on March 10, 2010, in Dental Health, Nutrition. Bookmark the permalink. Leave a comment.